Crystal clear cone bags are perfect for parties, gourmet food items, and favors. Our FDACB9 bag measures 6" x 12" and is ideal for holding chocolates, M&M's, popcorn, cocoa mixes, and more. Accessorize with a colorful ribbon, stretch loop, or twist tie for an attractive finish. This carrot-shaped bag makes a festive display and is food safe. 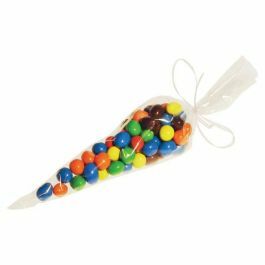 Showcase special treats and favors in our crystal clear cone bags. The FDACB9 cone bag measures 6" x 12" and is ideal for popcorn, chocolates, jelly beans, marshmallow and cocoa favors, and more. This bag is 1.2 mil thick and offers a unique presentation. Perfect for birthday parties, gourmet foods, gift baskets, and anything that needs a fancy package. Close this carrot-shaped bag with a colorful ribbon, stretch loop, or twist tie for an inviting display. FDA approved. Outer Dimensions: 6" x 12"
The primary use is for displaying food or small products.